New 'Predators' Project Teased for Reveal in San Diego at Comic-Con? In just a few days, our Comic-Con coverage kicks off in San Diego with plenty of big news, surprises and previews of some of the biggest films coming over the next year. Today there's a tease for something going down on the West coast during the convention involving the Predator franchise. By way of the Facebook page for the Nimrod Antal directed spin-off Predators, a new image was posted featuring a fragment of a satellite map of the area in San Diego near the convention center which will be overrun by nerds in the next few days. Presented in the Predator heat vision, the map features a hint at some sort of reveal. More below! There's a chance that there could be some kind of announcement revealing a Predators sequel, something that has been vaguely discussed since the release of the film three years ago. 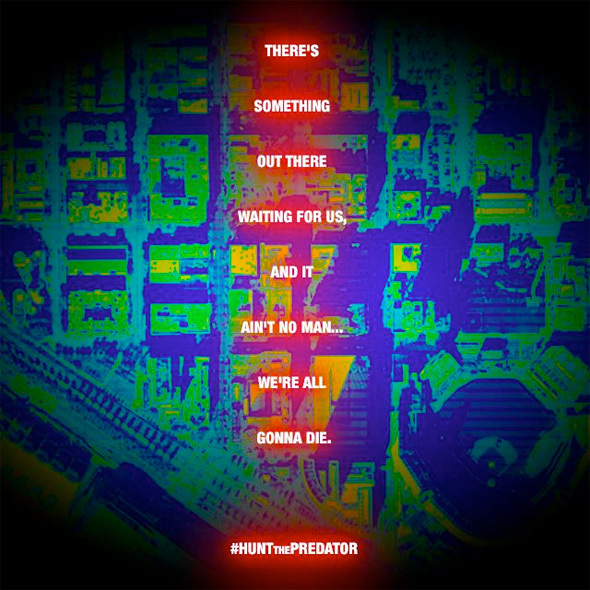 However, since the line used as text on the image is a direct quote from the original Predator, we're wondering if this just might be a tease for a video game or other sort of media besides a film. There's a small chance this hints at a reboot of the original film, but that seems very unlikely at this point. However, when Fox announced that Dawn of the Planet of the Apes and The Wolverine would be on their panel, they also teased a surprise. Could this be it? Hopefully we'll hear something more solid once we arrive in San Diego, so stay tuned for all our updates. UPDATE: Shock Til You Drop has learned the Predator tease is to promote the Blu-Ray 3D release. Not unless they do Prometheous type prequel or something i'm not really interested. Predators was just a joke. It had a few moments. Few. A 'Prometheus style prequel' is about the LAST thing I want for the Predators franchise...doing that to the Alien series was bad enough....I'd much rather have a new, interesting sequel than anything else. Well Adrien and Topher haven't left the planet YET . That's a place to start for a story They try to run to better land with the newbies , but the replacement Predators come too fast ? Didn't Topher get killed though? It was Alice Braga who survived with Brody. We need a logical sequel for "predator 2" and of course Arnie as old Dutch. I'd be VERY interested. Could you imagine a Predators sequel that has Arnold returning? Could be very fun. I'd love to see them move a little more into the future as well...into the sort of 'Aliens' territory would be fun. THEN maybe a few years down the line, they might give a REAL Aliens vs Predators film a shot. Let's just hope that it isn't a remake/reboot. Would love a human free predator movie, Something that explores their culture. It'd be interesting as hell...but not very 'mainstream', and the more money you ask the studio to give you, the more wide-appealing it needs to be for them. But even if we were to get sequences of no dialogue...it could be very fun. Heck, AVP-R was not an amazing film(I really enjoyed it for feeling like a creature-feature throwback) but the sequences where we were just dealing with the predator/predators and purely working off of visuals with no humans, and no dialogue...those were the moments where it actually shined quite a bit. I mean, the entire opening sequence of the movie...you get minutes into the film before any humans even show up and say anything, and in my opinion it worked quite well. The predator doing his lone hunter/detective type stuff at the crash site, in the sewers, etc...that was all very entertaining. I agree...I mean, as much as I enjoy B-movies and would like them to try to excel beyond a 'Oh, it's just a B-movie' mentality...at the end of the day, that's what they are. Texas chainsaw massacre in space for Alien, an over-the-top Arnold action flick for Predator...sequels of varying qualities...a movie that's entire concept is based around the two creatures meeting and fighting. This isn't Shakespeare. Why the heck does everyone hate the original Predator 2 so much, it's highly underrated. The setting was different than the original which I find new and creative so it didn't have to repeat anything again. It had some great action sequences and more action involving the Predators including a terrific climax which dived more into Predator mythology. I didn't mind Arnold not being in it at all, it's always best to keep the story fresh with new characters in a huge opened ended concept like Predator. I even loved the film Predators also. Why are most of the fans still butthurt on Predator 2 and Predators only just because Arnold wasn't in it, oh grow up and just enjoy it as a damn good action film as it was. I would love to see the setting moved back into a more urban setting but done right. I do not hate Predator 2 by any means...truth be told, if they could somehow restore the fully uncut version of that film(I heard it was submitted to the MPAA something like 17 times to get an R-rating) I would buy it in a heartbeat. Only a damn fool would hate on Predator 2. I also very much enjoyed Predators. Just bought it a few months ago actually. The setting was different, yeah, But it was the same basic movie, except nowhere near as good. Like The Hangover part 2. That subway battle with the nonstop strobe lighting is terrible as well. Direct Predators sequel of fupp off! So all they can come up with for this poster is recycle better lines from an earlier, far better movie? Screw Blu-Ray, 3D and most CGI too! If it gets me better movies I'll dust off my vcr and buy a working television asap!